Opposition leader Mahinda Rajapaksa said yesterday that there was a “major breakdown” in the bilateral relationship between India and his country after a new government was formed in New Delhi in 2014, but the opposition coalition he is heading now has a “good understanding” with India’s ruling party. He emphasised that the rule of thumb with regard to India-Sri Lanka relations should be that if an outgoing government has an adequately working relationship with his country, the incoming one should give due recognition to this, the PTI reported. “Past experience has shown that the danger of disruption in our bilateral relationship arises in the immediate aftermath of changes of government. Such easily avoidable disruptions have had serious consequences for both countries,” he said. “In 2014, the second major breakdown of bilateral relationships took place. Unfortunately, the working relationship that existed between my government and the outgoing government (UPA) did not roll over to the new government of India (NDA),” he said at the third edition of The Huddle, The Hindu’s two-day annual conclave in Bengaluru, India. 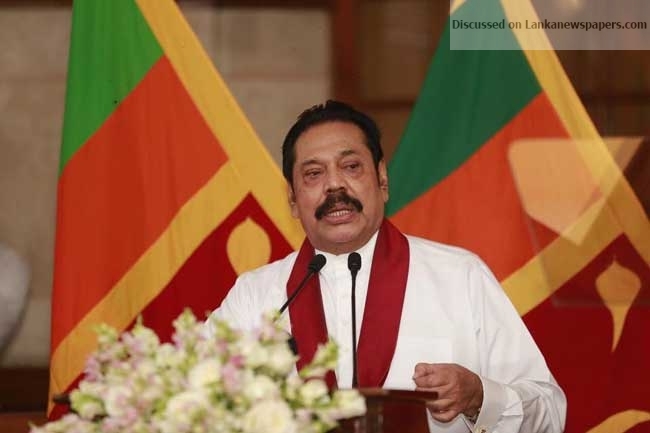 Rajapaksa said the misunderstandings of the 1980s and 2014 were aberrations that could easily have been avoided and it is key the two countries evolve a mechanism to prevent these misunderstandings from arising. The traditional government-to-government dealings alone cannot give shape to the two countries’ future relations because the world is becoming more complex by the day, Rajapaksa said. Political leaders would continue to play the most coveted role as they determine the policies — foreign, economic, security, and a host of other policies — and that would have bearing on the relations, he said. Tangibles like these are easier to monitor and even control, but intangibles pose grave threats, Rajapaksa said. “Political leaders and other societal leaders must always keep a tab on the intangibles. For instance, a wrong word from a leader would sour the relations as we have witnessed in the past,” he said. “Despite the snag of 2014, the opposition coalition that I am leading now in Sri Lanka has a good understanding with the ruling party in India,” he added. He said since the two countries are geographically in very close proximity, they have a mutual obligation to ensure each other’s security. “Often, we have heard the Indian leaders emphasizing the need for Sri Lanka to ensure that the Sri Lankan soil is not used by any third party that would pose a threat to India. Similarly, we too would want India to ensure that…any groups operating within Indian soil does not pose a threat to Sri Lanka,” he said. He also said in future bilateral relations, Indian Ocean maritime security too would be an important aspect in forging a well-founded strategy. “In all these, I strongly believe that a vibrant, on-going dialogue between the two countries would ensure each other’s national security. This dialogue as I have emphasized earlier should transcend the normal diplomatic boundaries and there are experiences such as the Troika that we could draw from,” he said. Forming such an entity is foremost in his party’s plans for the future, he added. “When addressing political stability, as we have seen in the recent past, this is one of the most crucial factors that would determine the character of our future relations. If any of our two countries has political turmoil and instability, foreign relations would be put on the back burner,” he said. He said both the States have always respected and stayed true to the Non-Aligned Movements’ principles of sovereignty, non-aggression, non-interference, mutual benefit and peaceful coexistence, he said. Rajapaksa was controversially appointed Sri Lanka prime minister by President Maithripala Sirisena in October last year, triggering an unprecedented constitutional crisis which lasted for over 50 days.